Like other tools, this interface can be opened from the Tools menu (more...). The square on the left represents the viewer's eye position. Dragging it horizontally adjusts the zoom. The vertical lines represent the near and far clipping planes, which always remain perpendicular to the line of sight and are “global” in that they apply to everything. Each can be dragged with the mouse. The lines emanating from the eye position show the field of vision. The lines diverge when perspective is used (default), but are parallel to each other in the orthographic camera mode. 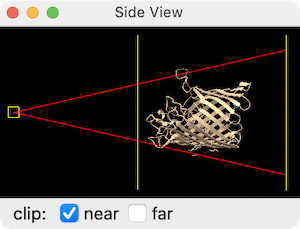 The auto clip checkboxes indicate whether the near and/or far planes should adjust automatically to avoid clipping the contents of the scene. If the interactive response becomes slow with very large structures or other copious or large data, closing the Side View may help by reducing the rendering load. Capping of clipped surfaces can be controlled with a preference setting and/or the surface cap command.